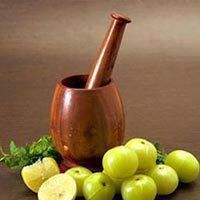 Amlaki Rasayan is very useful in loss of memory and rejuvenation. It also prevents falling of hair. Processed from Amalaki herb, Amlaki Rasayan is mother for all the human health ailments, from diabetes to acidity. Also, it is effective in treating indigestion. Rich in vitamin C, Amlaki Rasayan is a restorative tonic and antioxidant that improves the immunity of human body to fight against infections.